iPhone is one of the best smartphones, introduced by Apple, which brings a revolution in the mobile industry. This product is widely popular around the globe and a huge number people prefer iPhone for its exceptional features. With the technological development, Apple releases the latest versions of iPhone with more extensive features. Apple released iPhone 6 in 2014 with a larger display, more RAM, a huge amount of expandable memory and more features. After the release, this product gained a lot of popularity and people love this device for its smooth operation. But like other electronic devices, iPhone 6 is also not bug-free. In recent days, a lot of people are complaining about iPhone screen flickering and unresponsive. 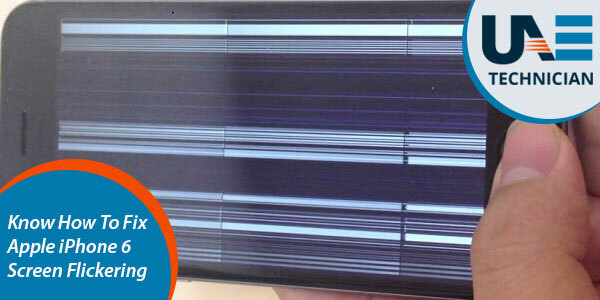 If your phone screen starts flickering, that would be very frustrating for you. There are some hardware and software issues which may cause this problem. So, if you are also confronting the same trouble, then there is no need to worry. In case you are thinking about how to fix Apple iPhone 6 screen flickering, then you have come to the right place. In this article, we will discuss the reasons behind iPhone screen flickering and the easy fixes. So, go through the article and perform the easy steps to fix the problem at the earliest. Screen flickering is such an annoying problem, which can prevent you from accessing your iPhone. Before learning how to fix Apple iPhone 6 screen flickering, you must know what are the main factors, that are causing this problem. The screen flickering problem is mainly linked to a faulty hardware component. After using your phone for several years, you may face many hardware issues along with this. Also, you may find the same problem, which may occur due to poor software optimization. Some people face iPhone 6S screen flickering lines, which usually show up while taking photos or recording videos. So, this problem is basically a mixture of hardware and software issues. If your iPhone is running out of memory or has insufficient space to store some files, that can create your iPhone screen flickering problem. The symptoms of having low memory include sluggish performance, random crashes, and unresponsive display. If your system has any hardware related problem like broken components in the display circuit board, it can also cause iPhone screen flickering after drop. It usually occurs due to phone dropping or seepage of water inside the iPhone circuit. You may not able to see the effect immediately, but you might have to go for an iPhone screen repair later. It can also occur due to some software related problems. Maybe, you have a corrupted software update, that is triggering the screen flickering problem. How To Fix Apple iPhone 6 Screen Flickering With Easy Solutions? After knowing the probable reasons for the iPhone screen flickering problem, you can try some easy steps to troubleshoot this issue. Sometimes, you can fix Apple iPhone 6 screen flickering just by reducing the screen brightness. Many users have reported that this trick is very easy and useful. So, you can try to disable the auto brightness on your iPhone from settings and check whether the problem is solved or not. To make the necessary changes, open Control Center, from where you can manually set the brightness. Alternatively, you can go to the Home screen and open the Settings tab. There, you will find Brightness, click on that and then turn off the auto brightness from there. This is an easy method, that you must try first. You can do both hard reset and soft reset to fix Apple iPhone 6 screen flickering problem. Soft reset is another term of restarting your iPhone, which can be very useful for this problem if there is no such complicated software present in your device. Like other computer programs, your iPhone apps can also face random errors, which can cause your device screen to flicker. To perform this, you can press and hold Power button and scroll to select Power off option. After turning off, you can press the Power button and hold it for 20 seconds until boot start. If your screen seems unresponsive after doing a soft reset, then you can try a hard reset, which is also known as force restart. This method is very effective to remove any software glitches, which can cause the screen flickering problem. To perform a hard reset, you can press and hold the Power and Home button together for 20 seconds. Then, wait until the Apple logo appears. When you are thinking about how to fix Apple iPhone 6 screen flickering, then enabling Reduce Transparency can be a good solution for you. You can perform this by going to the Settings. There, you can select the General option and then click on the Accessibility. After this, you will find Reduce Transparency option; toggle the switch to enable the option for completing this step. The unresponsive display is an indication of insufficient memory in your iPhone. When the flickering screen is triggered in your iPhone, then you must free up some memory space. To perform this, you can delete some unnecessary files from your phone or you can uninstall some apps. Also, you should clear the caches to free memory space. This can be an effective iPhone screen flickering fix. If the screen flickering occurs only on certain applications, then you can try to disable iCloud Sync for iWork. This can be an effective solution to fix Apple iPhone 6 screen flickering. To give this a try, go to the Setting first and then select iCloud from there. Now, go to the Documents & Data and scroll down to the applications, with which you are facing the problem. Toggle the switch next to the apps to disable and complete this task. If some dust or dirt is present on your screen, that can also cause screen flickering problem for your iPhone. So, clean the iPhone screen in a proper manner, that can solve the display unresponsive problem. Also, you can replace the LCD screen, in case you have a defective LCD. The DFU mode means Device Firmware Update, that will allow you to make changes in the operating system to fix Apple iPhone 6 screen flickering. To perform this, you can connect your iPhone to your computer by using a data cable. Then, launch iTunes and turn off the device. Now, you can press the Power button and hold it for 10 seconds. If you see that the iPhone screen remains black and does not show recovery mode, then DFU mode is successfully activated in your device. Hope these steps will answer how to fix Apple iPhone 6 screen flickering and solve your problem quickly. If you require tech assistance, then opt for an immediate iPhone screen repair. You should check if iPhone screen flickering after repair to avoid the issue any further. Wondering How to Fix Frozen iPhone after iOS 11 Update?